January 26, 2018 / Guest / Comments Off on How Do I Prototype an Extrusion? Whilst there is tooling involved, it is not in the same league as injection mould tooling, being quicker to manufacture and significantly cheaper. 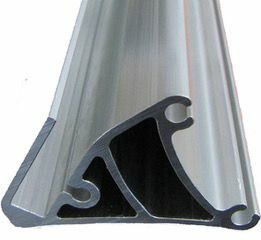 As a process it is commonly used with both plastic and aluminium to produce components such as pipes, window frames and conduits. Whilst this is good news for production, manufacturing prototypes or short runs can be challenging, but that is why Plunkett Associates is here! To understand the options, we need to look at aluminium and plastic separately. With aluminium, we can wire erode. Hence the most common option if the part required is in sub 600mm in length, is to wire erode. Whilst the process is relatively slow, the wire is very fine, resulting in good detail and surface finish. 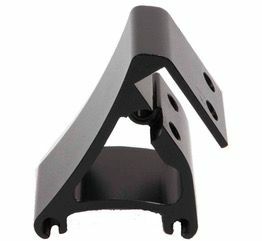 If the part is longer than this, yet the form is simple, it may still be possible to cnc the prototype up to lengths of 1 metre. However this is extremely sensitive to geometry and wall section and will not be applicable in all cases. The third option is to actually extrude the section, requiring a development die to be produced. This will not only require additional leadtime but also access to an extrusion line, so will be typically 4 – 5 weeks as opposed to 10 days for a wire eroded length. There will also be size limitations, as the larger extrusion lines are just not available on economic terms to run a prototype batch. The extrusion produced is in effect a trial batch to validate the die and is usually up to 20 metres. (Currently the largest extrusion Plunkett Associates can run in this way would have a CCD** of less than 200mm or have a weight/unit length of less than 7kg/m). When it comes to plastics, the most widely extruded material is PVC. Whilst other materials are available in production quantities, it is almost impossible to find suppliers willing to run prototype sized batches. (To put things in proportion the MOQ would be in excess of 1km). Unlike aluminium there is no option to wire erode samples either. If the form is simple, CNC machining remains viable up to lengths of circa 1 metre. Additive manufacturing (3D printing) can help with ‘similar to’ materials. A common choice is Selective Laser Sintering (SLS) that can prototype lengths of up to 700mm in materials such as nylon (PA 12). Rubbers and silicones can also be extruded relatively easily so long as the part size is not too large. At Plunkett Associates we can support you with part cross sections up to and beyond a 50mm O/D in PVC and silicone, and in exceptional circumstances other plastics on a strictly research basis. Lead-times will be of the order of 3 – 5 weeks depending on complexity. As always, please call to discuss your requirements on 01452 386608 and we will do our utmost to support your needs.